The weekend ransacking of a church compound in Khartoum illustrates the increasing hostility faced by some of the hundreds of thousands of residents of the Sudanese capital whose origins lie in what is now the independent state of South Sudan. Seven years after southern rebels and Khartoum signed a deal to end decades of civil war and nine months after the country split in two, recent borderland clashes have given rise to fears of a return to all-out conflict. On 21 April, a 300-strong mob attacked a Presbyterian church compound in Khartoum’s Al-Jiraif District, torching parts of the premises, witnesses told IRIN. As well as a church, the compound included a home for the elderly, a medical clinic, a bible school and priests’ living quarters. Most of the church’s congregation is made up of people with roots in South Sudan. “They burned the bible and looted possessions and money,” said the church’s Father John Taw, adding that the attackers included women and children. “During Friday prayers, the imam of the next door mosque, who is known for his extremism, incited people to destroy the church, saying the land it was on belonged to Muslims,” he said. The priest said he believed the imam’s words were linked to a government deadline that all South Sudanese in Sudan - who number some 500,000 - should register as foreigners or head back to South Sudan. The priest added that hostile rhetoric had escalated two weeks earlier, as Sudan and South Sudan’s armies began to fight over the disputed borderland Heglig oilfields. “The mosques were inflaming people against southerners and Christians over the last two weeks,” said Taw. “A huge group of men and women marched towards the church and burned the area around it,” said a church guard, who gave his name only as Yahia. 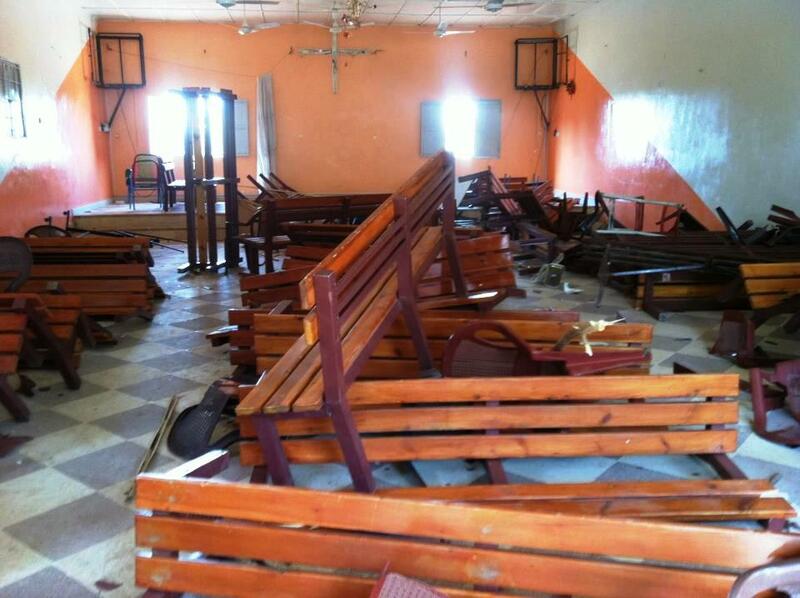 Two independent churches in the district were also attacked, Rev. James Par Tap, the moderator (head) of the Sudan Presbyterian Evangelical Church said in a statement. “The group burned, destroyed, and looted everything in the churches and the Bible school including books, air conditioners, computers, photocopy machines, refrigerators and many other things. They even took the students’ things like books, bags, and clothes, and they burned them, as the students were not there,” he said. The day after the attack, church members and activists tried to mount a clean-up operation but police prevented them entering the compound. Civil society movements, including Girifna and Sharara, condemned the incident, linking it to the government’s anti South Sudan statements amid the Heglig crisis. On 18 April President Omar al-Bashir vowed to “liberate” South Sudan from its government, labelling it an “insect” regime. “The incident demonstrates a very worrying direction towards further intolerance in the country due to the hateful, marginalizing propaganda led by the NCP [the ruling National Congress Party],” the Sudan Change Now movement said in a “public apology” issued on 21 April. “These types of hateful acts of violence and racist crimes are unacceptable, unethical and unconstitutional. We, the people of Sudan, are of various ethnicities, faiths and races; and we stand together against such crimes and say these crimes are Not in Our Name,” the statement said. William, 23, who only gave one name, is one of many South Sudanese who have been living in a makeshift camp around Shajara train station. “Whenever any fighting erupts over the borders, I just stay here,” he told IRIN. William said some of his friends had been beaten up and attacked by people calling pople from South Sudan “enemies” who want to take over Sudan. “My biggest problem now is that I’m no longer legal. I can be robbed, beaten up or even killed and no one would care or even recognize me,” William said. In a recent lecture in Juba, veteran Sudan analyst John Ashworth explained that the issue of “identity” was the primary cause of the civil wars that have ravaged Sudan for most of its post-independence history. Sudan used to be “a multi-cultural, multi-religious, multi-lingual, multi-ethnic country - multi-everything, in fact,” he said. Although Khartoum has extended by a month - until 8 May - the registration deadline for South Sudanese, the process lacks clarity in the absence of an effective public information campaign. “The government has not made clear where this registration will take place,” the Enough Project said in an 18 April statement. “While details surrounding the registration process remain opaque, without any identification documents, it will likely not be possible for southerners who wish to remain in Sudan to register,” it added. On 7 April, a dozen South Sudanese government officials arrived in Khartoum to start issuing emergency travel documents, according to the UN Office for the Coordination of Humanitarian Affairs (OCHA). South Sudan’s embassy in Khartoum also plans to issue national certificates and passports, OCHA said. Aside from the issue of paperwork, moving people to South Sudan is a huge challenge because of their vast numbers, the lack of sufficient transportation, borderland conflict and weak capacity in South Sudan to move the returnees to their homelands and provide them with basic services. In March, Khartoum and Juba drafted a deal that would grant extensive freedoms - including residency and work permits - to each other’s citizens, but the intervening escalation of conflict has put this arrangement on hold.